In an ideal world, it would be possible to place agents in all pirate networks, that would then act to detect and identify pirated material. This would mean rapid detection wherever piracy occurs. Unfortunately, it isn’t practical to infiltrate these networks for any single player – the scope is just too large. But what if everyone could be a piracy detection agent? What if it were possible to turn every single pirate in every network into a potential informer? This is what Screener Copy by Custos does. You go on screenercopy.com, upload your movie, and input the emails addresses of some reviewers that you know. On the back end, the platform generates unique copies for each reviewer. In each copy, using cutting edge forensic watermarking, we embed a Bitcoin wallet. This number is not visible to a viewer, but encoded into small variations in the colour and brightness that a human eye won’t be able to see, but that will remain in the copy even if you copy or compress it. Those variations, and the unique number – i.e. 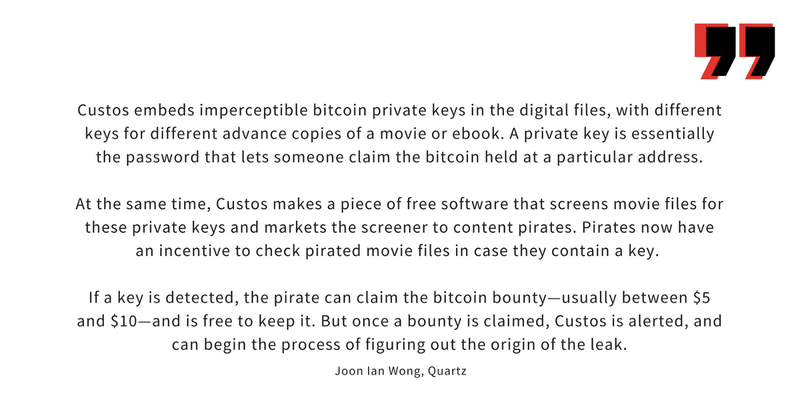 Bitcoin wallet – contained within them, are what make up our forensic watermark. 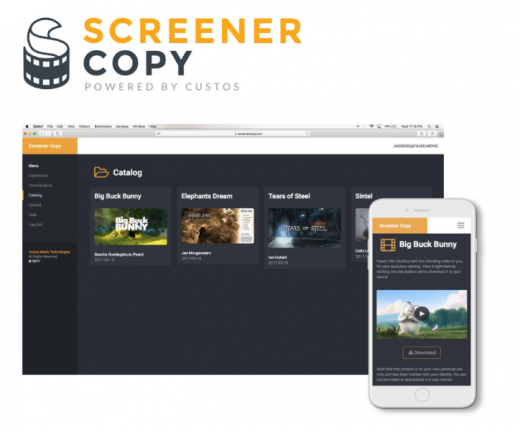 Screener Copy is Custos’s SaaS (software-as-a-service) product for independent film producers and media distributors. A Screener Copy user can simply upload content, get it watermarked with our blockchain-based tracking system, and nominate a list of recipients to receive unique links to view the video. In a larger-scale example, a Tokyo-based client of ours uses a custom-branded, white-labeled SaaS product we built for secure distribution of movie screeners to a network of buyers across Japan. If you’re interested in getting your own custom-branded secure content distribution platform built by our team, get in touch today. There are a lot of exciting developments happening in the Blockchain for media space. Ujo Team for example, is tackling royalty payments in the media industry with big customers like Imogen Heap and RAC already onboard. PopChest is making a blockchain-based YouTube competitor which makes it easier for creatives to monetise their content. ascribe tracks ownership of digtal artworks on a blockchain. And SingularDTV is trying to replace the old film studio model with a tokenised economy.